This is a special recipe. You know what I mean. The kind of recipe that only gets made for special occasions. It takes the whole day and makes your house smell like a five star restaurant. 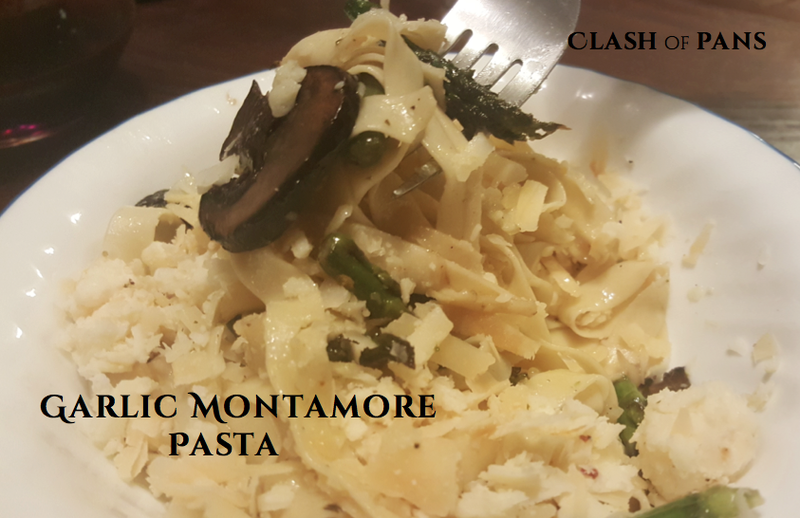 A meal that you plan ahead for and anticipate for days, telling your family over and over to be ready, because they won’t want to miss out on this one fabulous meal. That is what kind of recipe this is. I had the opportunity once to spend some time in Italy, and of course what I remember most is the incredible food. The beauty of Italian cuisine is that it is not about ridiculous, complicated recipes. The focus is on gorgeous ingredients, treated with love. To me, treating ingredients with care and respect is one of the most important parts of being an excellent chef. That goes for all ingredients; from the lowly celery to a gorgeous piece of steak or seafood. When you love your food it loves you back. I promise, you can taste the difference. Showing your product love and respect starts with picking quality ingredients. There are lots of ways to save money in the kitchen. Choosing bad produce or low quality cheese or wine is not the way to go. Next, it means careful knife work, making sure your cuts are even so each piece is exactly the same size. This makes sure every bit is cooked just right, nothing under or over done. It also means not cutting corners. 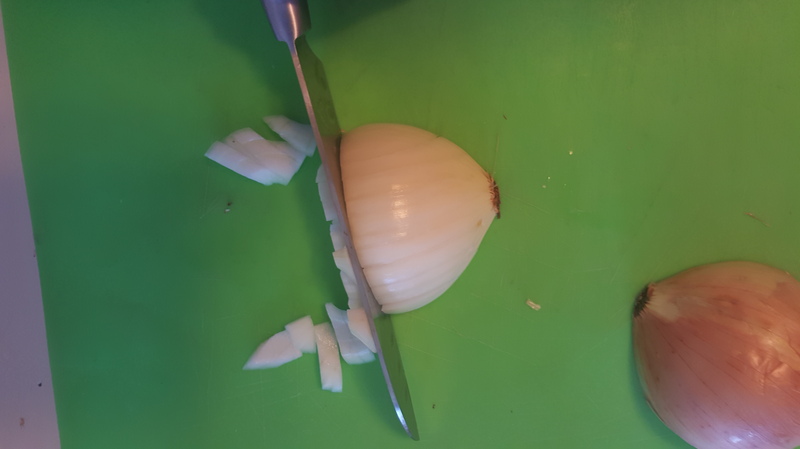 Do not buy pre-cut onions or steak at the store. You have no control over the quality or freshness. Take your time and give the food the love it so desperately wants. Of course, this also means making your own fresh, beautiful pasta. 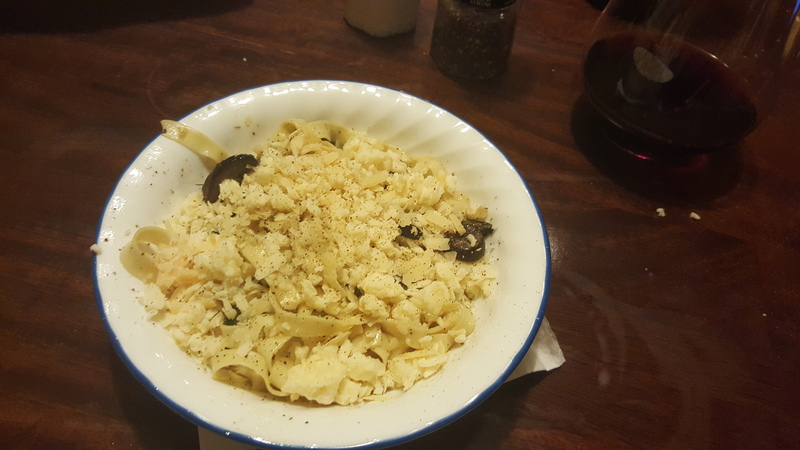 Fresh pasta cannot be replicated or replaced by dry store bought pasta. 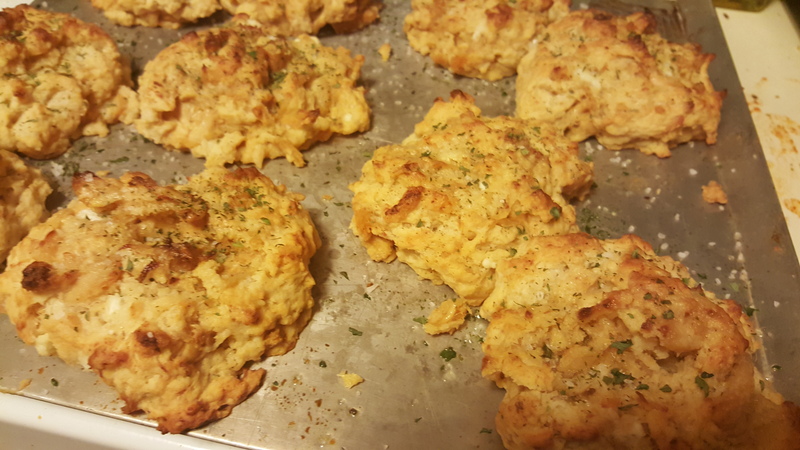 It is one of the most heavenly things a kitchen can create, and it is absolutely worth the extra time. Once you get used to making it, you won’t even notice the extra minutes. 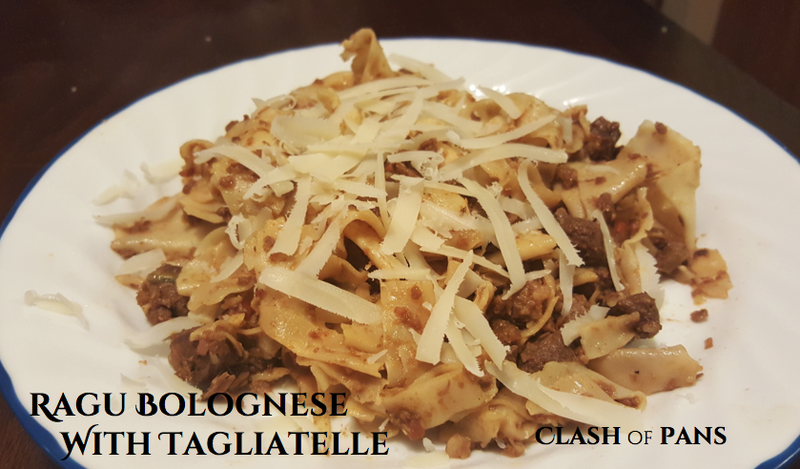 This pasta is hand cut to make thick, luscious tagliatelle noodles. If you have never made your own pasta, buy a roller, and learn. Your life will never be the same. Finally, be willing to take your time when cooking. Some recipes take a while and benefit from sitting on your stove all day. Those recipes are often the best of them all, and the extra time is definitely worth it. I know, we’re all busy. 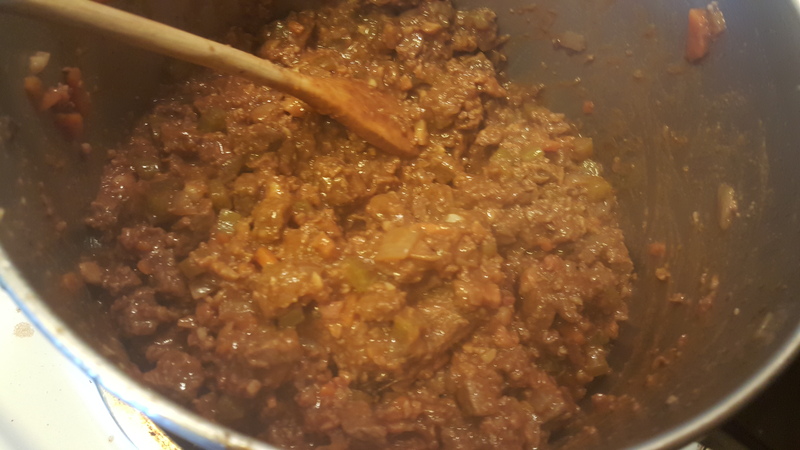 But sometimes you just gotta drop everything else and make Ragu Bolognese and pretend you are back in the Italian countryside. 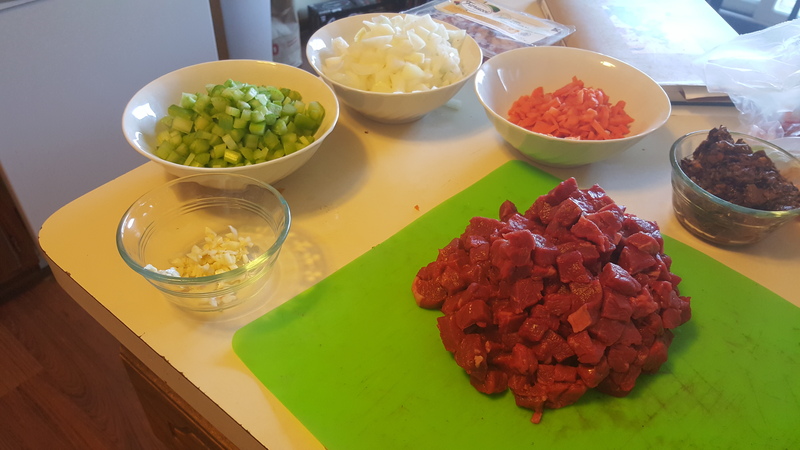 Start by preparing your mise en place, which translates to “things in place”. Literally, get your ingredients ready so that when you need them you aren’t scrambling. So the first thing we do is cut up our ingredients and make sure everything is ready to go! Again, take your time to cut everything to be the same size, especially the steak. The more consistent your cuts are on the meat, the better this dish will be. Trust me. Love your food, and it will love you back. First, rehydrate the mushrooms. cover the mushrooms with about 1 cup of boiling water. Let sit for at least fifteen minutes, then remove the mushrooms from the water and dice. Reserve the water. Now we start cooking! He 2 tablespoons of olive oil in a large saucepan over medium heat. 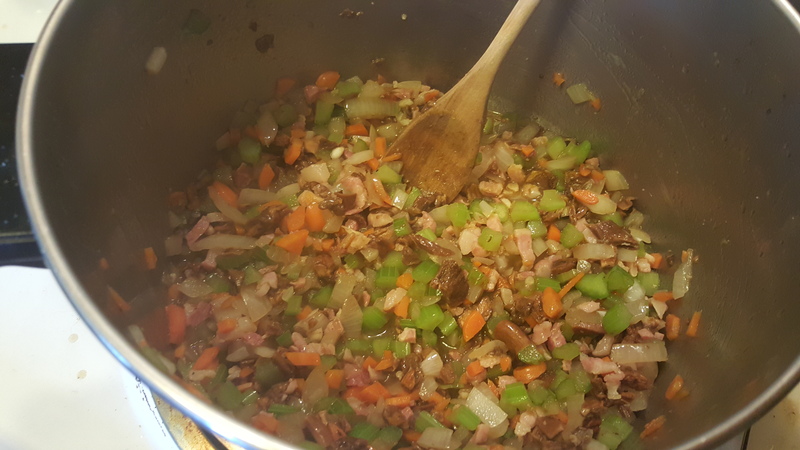 Once hot, add the diced pancetta. 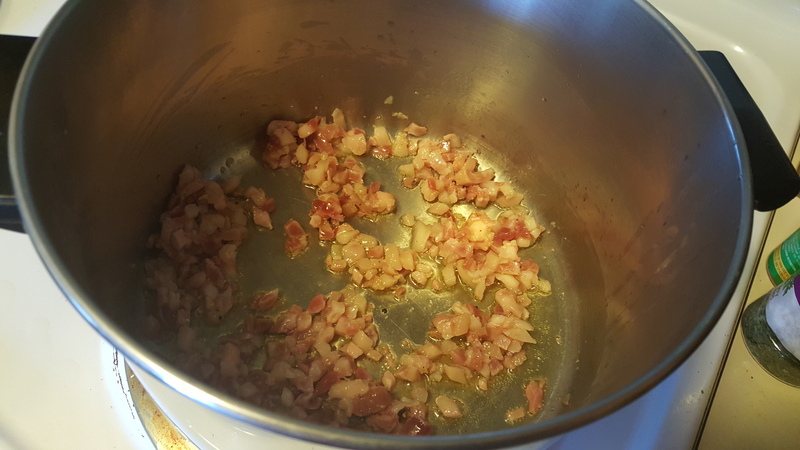 Let cook for about 3-4 minutes, or until the pancetta releases its fat and begins to brown. 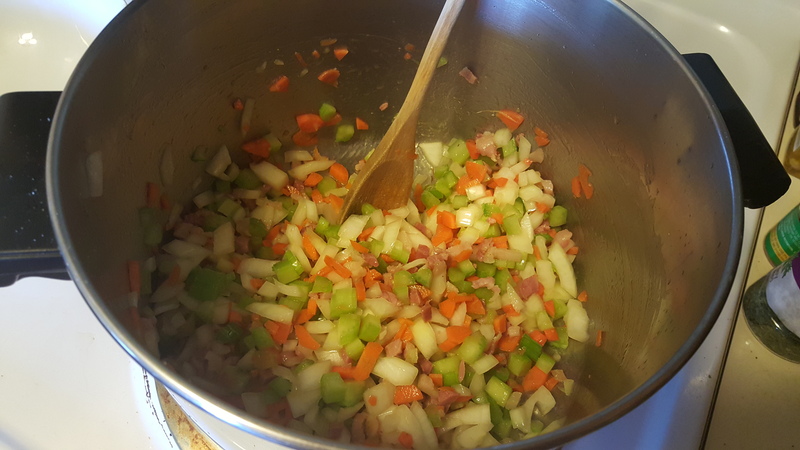 Add the celery, carrots, and onions. Cook for about 10 minutes, stirring occasionally, as the veggies begin to soften. Add the mushrooms and about half the mushroom water. Cook for about 15 minutes, or until the liquid is cooked out and the veggies are very soft. Remove the veggies from the pan and put in a separate bowl. Put the same pan back on the heat, increase to medium high, and add about two tablespoons olive oil. (Do NOT wash the pan in between!) 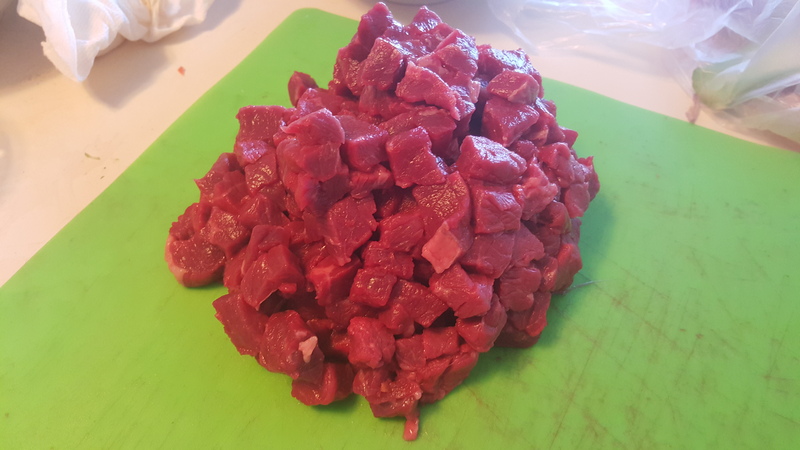 When the oil is hot, add the chopped steak, along with a bit of salt and pepper. Cook until browned on all sides and then remove from heat onto a plate using a slotted spoon. 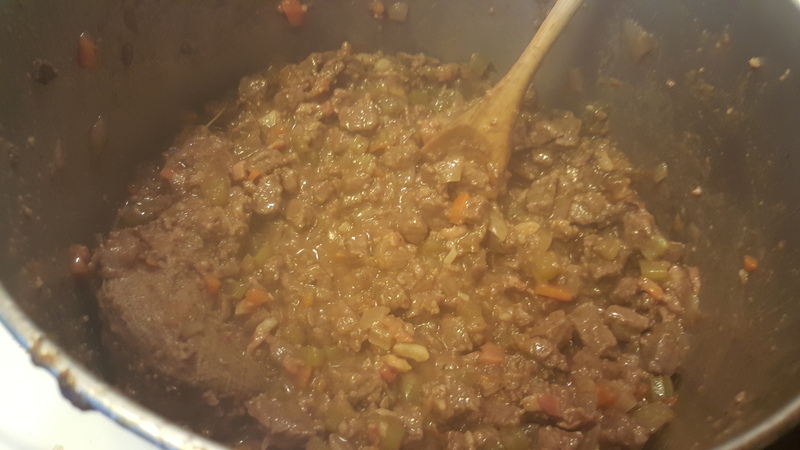 Into the same pan, add your ground pork and cook until the pork is browned. Turn heat back to medium. Put your sage, thyme, and bay leaf into cheesecloth and tie off with kitchen twine to make a bouquet garni. Add the veggies, steak, and the bouquet garni back to the pan and let cook for about 8 minutes, or until the liquid is cooked down. Add the wine, making sure to scrape the bottom of the pan. Let this cook down for about 15 minutes, until the wine is cooked off. The pot should turn a gorgeous, shiny color at this point. Add the tomato paste. Let cook for about five more minutes. It should be starting to look very, very pretty. Add 1.5 cups of stock and 1/2 cup milk. Let cook for about 15 minutes, stirring every few minutes. Finally, add the rest of the milk and stock, the parmesan rinds, nutmeg, and a touch of salt. Let simmer for about 1.5 hours, skimming the fat from the surface occasionally. You may want to lower the heat. 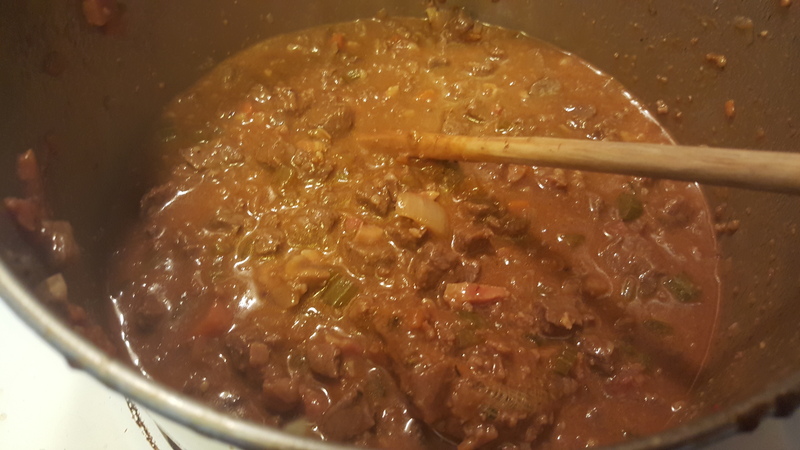 Sauce should thicken and become velvety and rich. This sauce can be made a day or two ahead of time, and only becomes better with age. 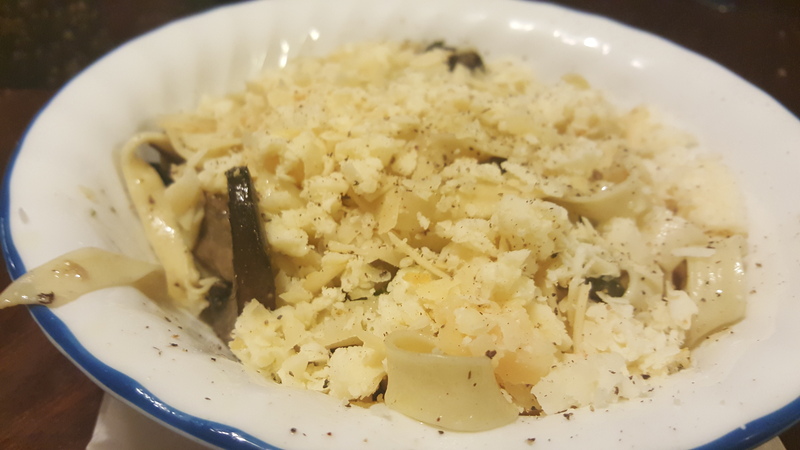 Top with fresh grated parmesan. I’m gonna go eat now. K bye. For now, the weather is gorgeously cool and cozy. 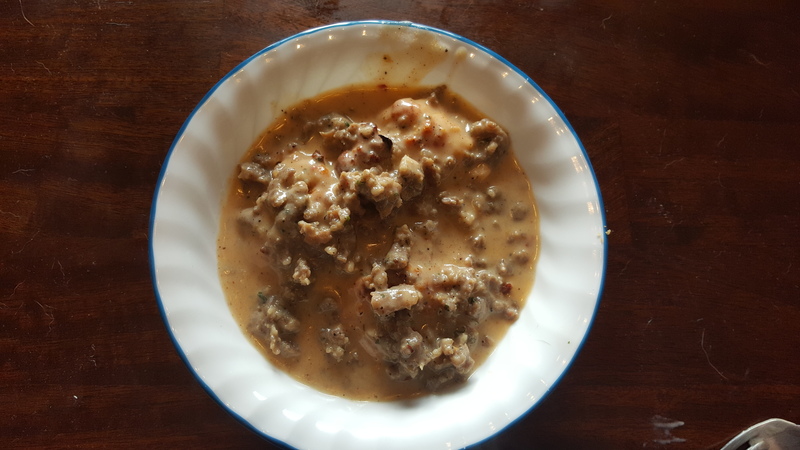 Perfect for crockpots and warm comforting meals. There is nothing better than coming home after a long day at work to the smell of delicious food that is already cooked and all you have to do is sit down and eat it. 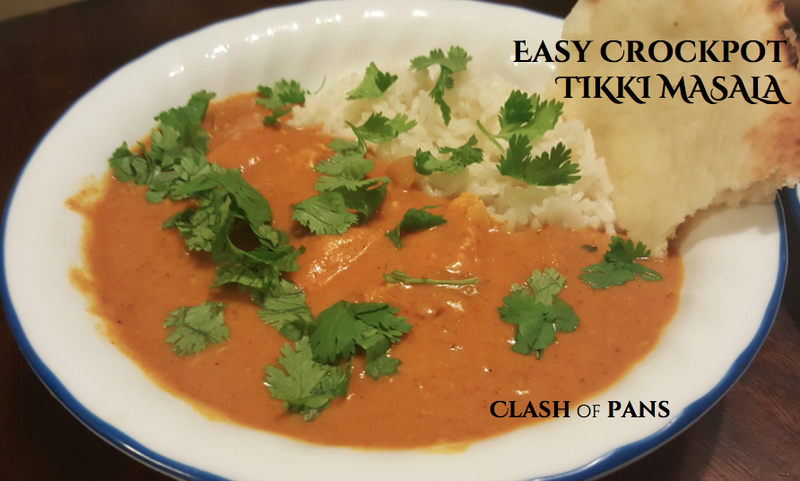 As far as the recipe, it is sort of a lightened up non-traditional take on a Tikki Masala. I used coconut milk instead of cream. It was delicious. 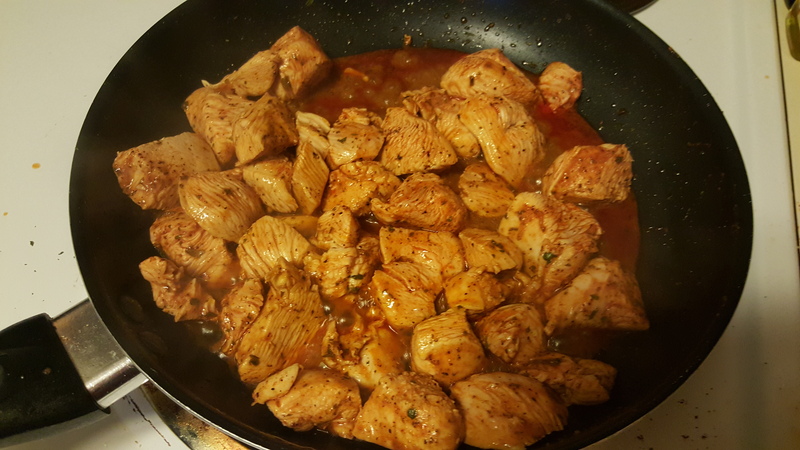 If I was cooking this just for myself I would have used more cayenne instead of paprika to bump up the heat, but the fiance isn’t a huge spice fan so I was kind and didn’t do that. 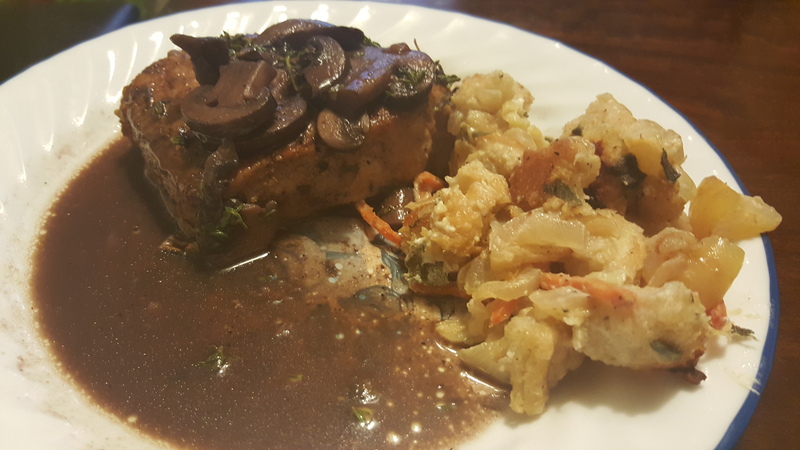 I also made the sauce and starting marinating the chicken the night before, so all I had to do was throw everything into the pot the next morning and turn the crockpot on. You can now refrigerate the sauce and chicken overnight, or get it started. Add the chicken to the sauce in the crockpot and cook on low for 8-10 hours. When ready to eat, pour the whole thing into a large skillet. 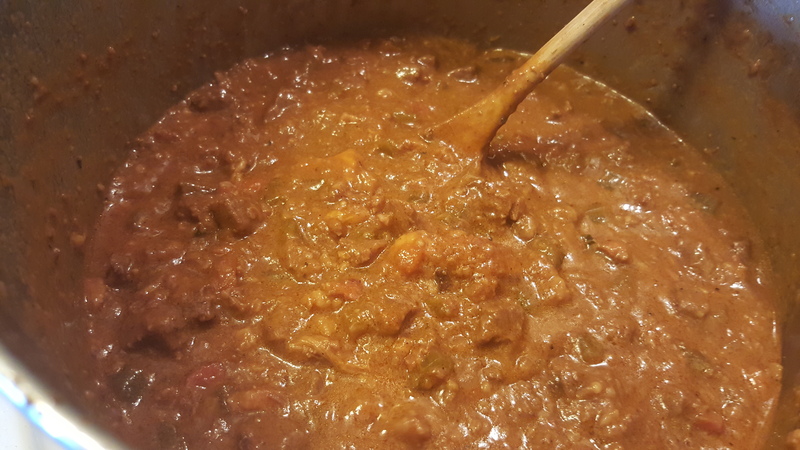 Add the coconut milk and cornstarch and let cook down and thicken for about 10 minutes while you are getting the rice or other accompaniments ready. Finish with juice of one lemon before serving. 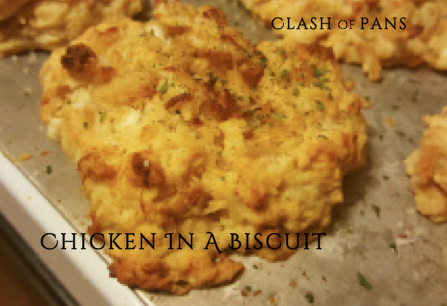 Serve with rice or naan bread or both (like I did, because I am bad at making decisions). Garnish with cilantro. The school year is now in full swing, and I haven’t quite regained my time management skills from last spring. It’ll get there, but right now I barely have time to cook food, much less write about it afterwards. I can’t figure out how I got everything done last year. And this year I am also taking a class to finish my master’s degree, AND planning a wedding. So you know, just a little busy. 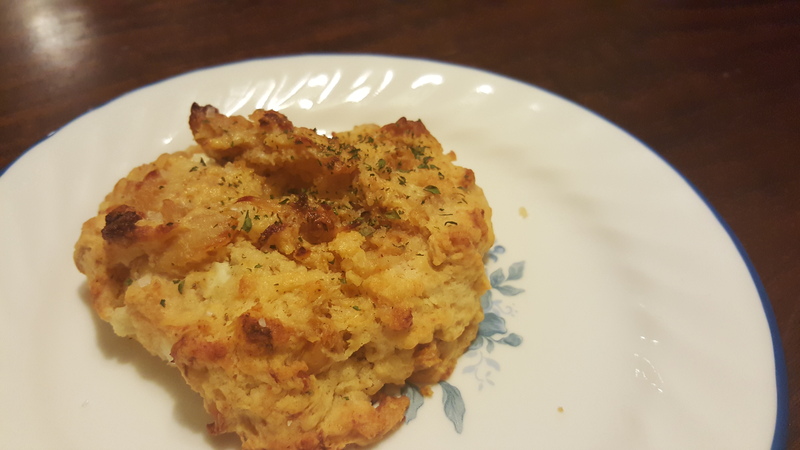 Even with all that, I just couldn’t keep this recipe away from you all. There is too much to love. 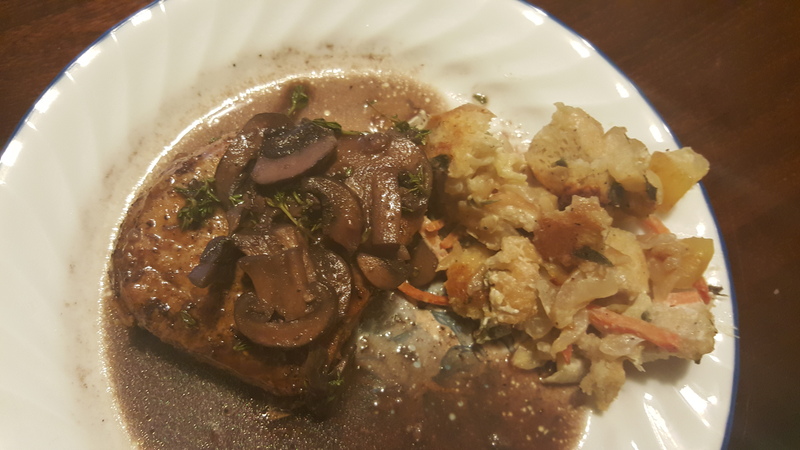 The pork chop is drenched in velvety sauce with delicious mushrooms. 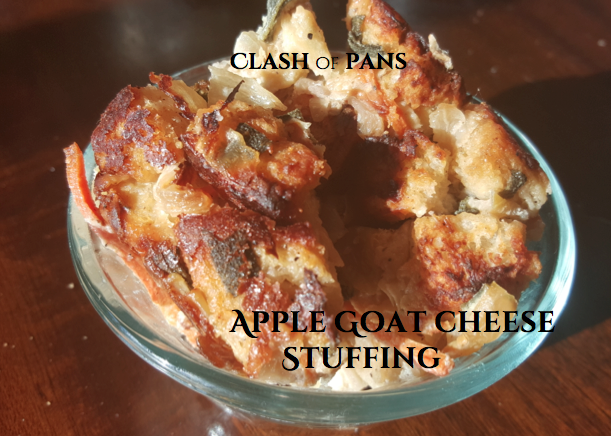 I often talk about my love for pairing pork with apples, and the stuffing is the perfect vessel for that. Especially combined with loads of creamy goat cheese. The flavors are perfect for fall. Or whenever you just want comfort food. There are two recipes here. One for the pork chops, and one for the stuffing. They are like the perfect couple. I suggest starting by making the stuffing, then cooking the pork while the stuffing bakes. Dice the onion and apples and set them in a large skillet over medium heat, with a dollop of olive oil, salt, and pepper. While that cooks, dice the bread. 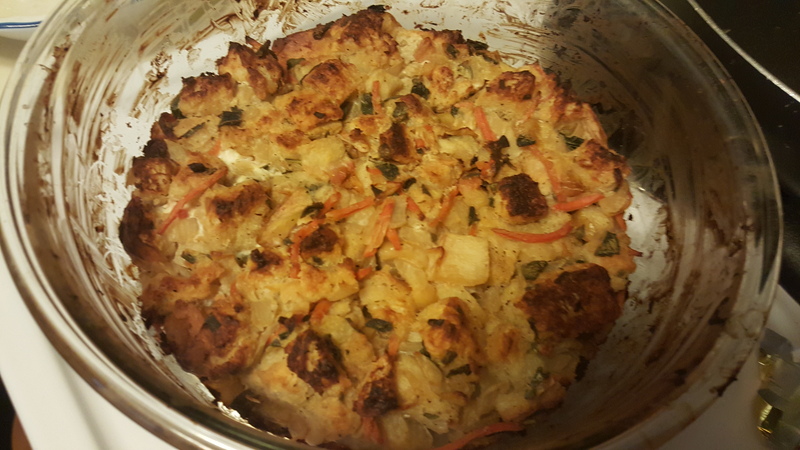 Spread onto a baking sheet and bake at 350 degrees for about 10-15 minutes, or until the bread gets a nice toast on it. 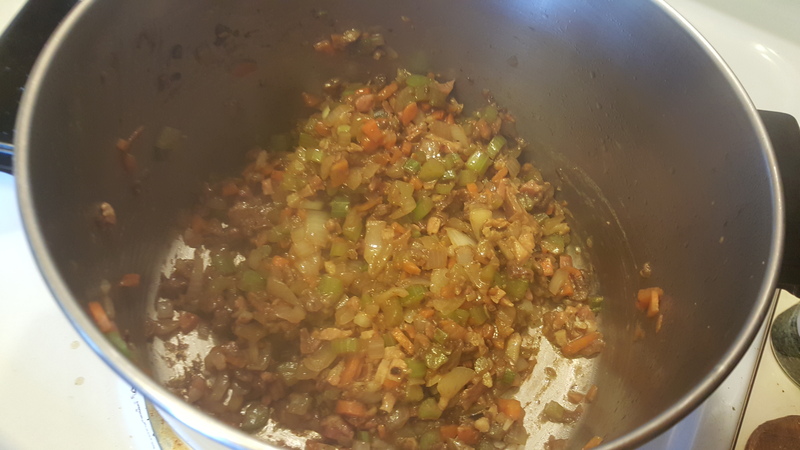 After getting the bread in the oven, when the onion starts to get soft, add the carrots, garlic, and sage to the onion and apple mix. Let them cook until the apples get soft all the way through, about 10 minutes. Add the chicken stock and let simmer down until most of the liquid is cooked off. When just a little liquid is left, take a large baking bowl and combine the apple mix with the bread. Crumble in the goat cheese and combine well with a wooden spoon. 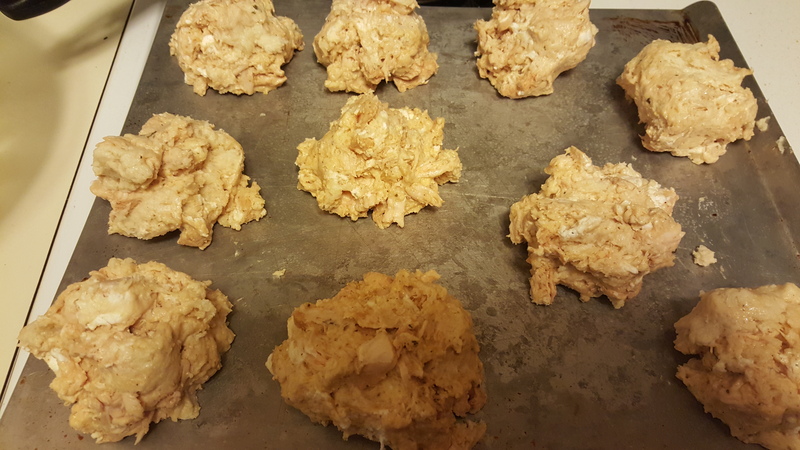 Make sure it is spread evenly in the baking dish. Turn the oven up to 400 degrees and cook for about half an hour, or until the top starts to look crispy. While the stuffing cooks, make the pork chops. Put 1 1/2 T butter in your cast iron pan. Melt, then add the mushrooms, garlic powder, salt, and pepper. Cook the mushrooms until they have released all their moisture, then soaked it back up. 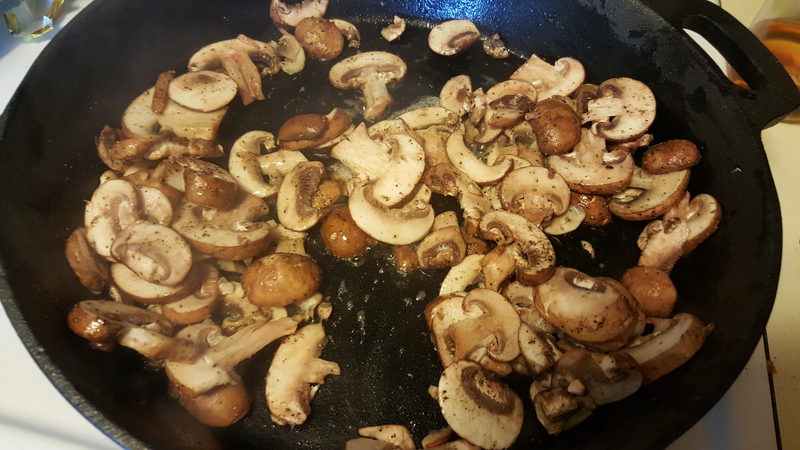 When the mushrooms are done, remove them from the pan and into a bowl. In the same pan, melt the rest of the butter. Sprinkle the pork chops on both sides with black pepper and the flaky sea salt. Cook for about 5-8 minutes on each side, or until the pork has a good sear. 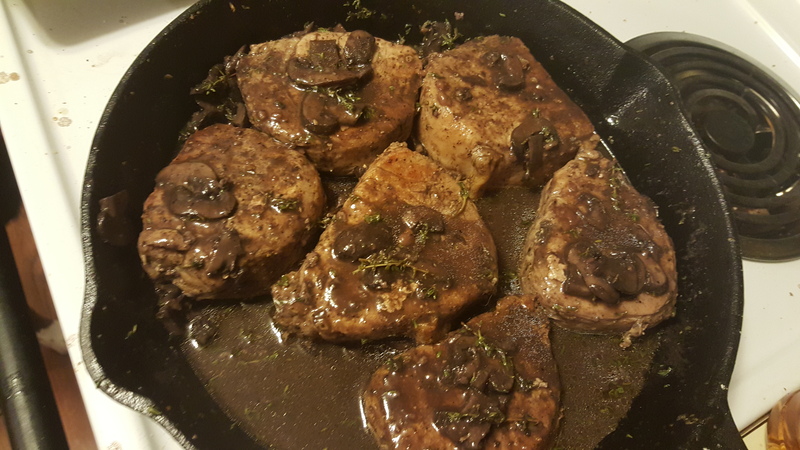 My pork chops were pretty thick, so after searing I put them in a baking sheet and put them in the oven to finish cooking for a few minutes. 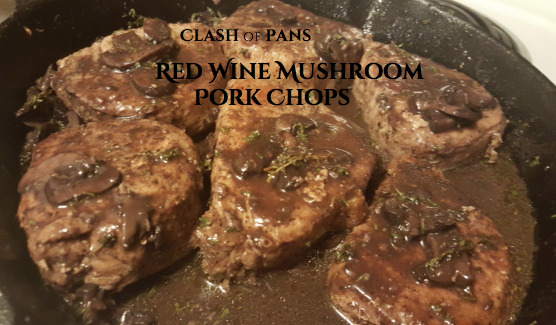 After you take the pork chops out of the pan, deglaze with the red wine. Bring to a simmer and add the beef broth and thyme. 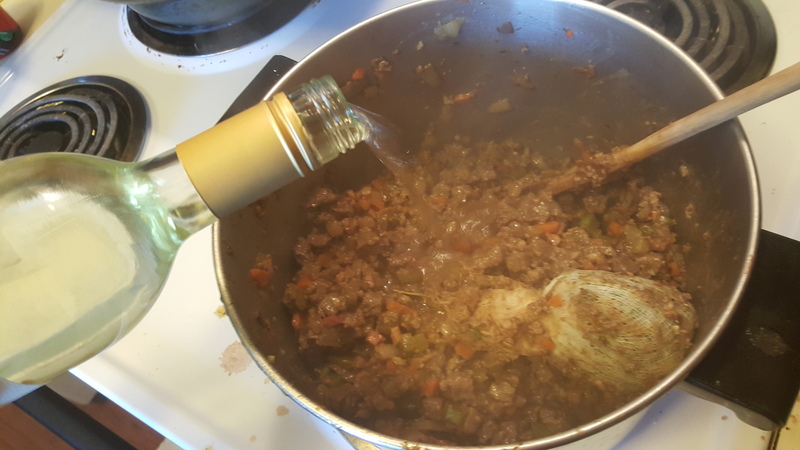 Let the wine simmer down until it starts to thicken. Remove the pan from the heat and add the pork chops back in to thoroughly coat them with the sauce. Now you get to eat! My favorite times of the year are fall and spring. When the weather ranges between 50 and 80 degrees fahrenheit I feel like I’m in paradise. The cooler weather, of course, also brings back cravings for food that is warm and comforting. Curry fits this perfectly. 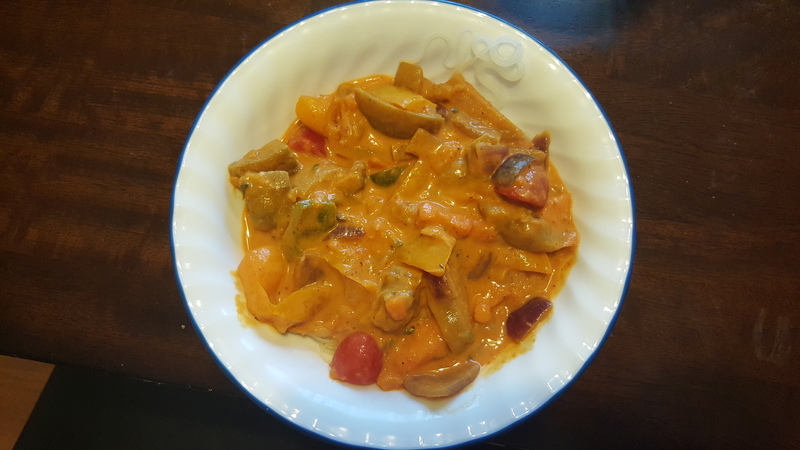 I adore curries of all shapes and sizes, but possibly my favorite is Thai curry. 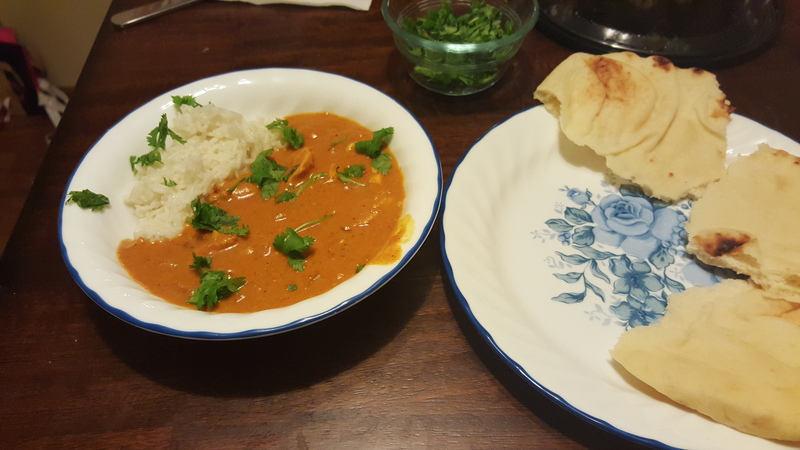 Spicy curry paste and creamy coconut milk are a dream combo. 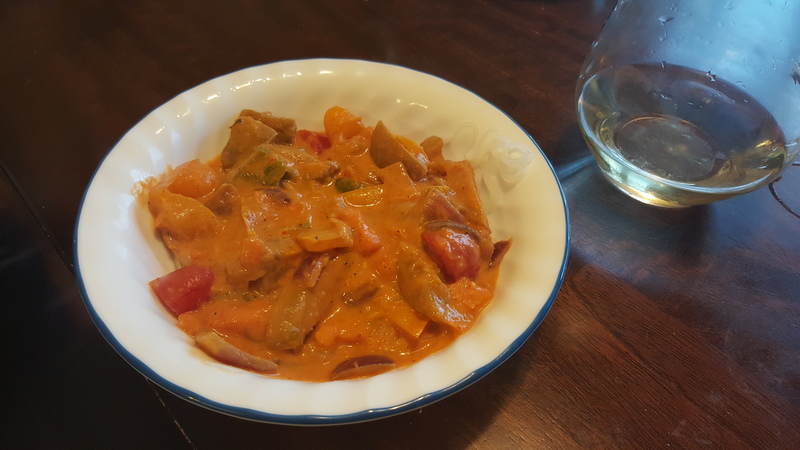 For this version I used luscious eggplant, or aubergine, along with sweet potato, peppers, and onions to make the curry rich and flavorful. The eggplant replaces any meat for me in this dish. It has a fabulous earthiness that is to die for. You won’t even miss the meat. 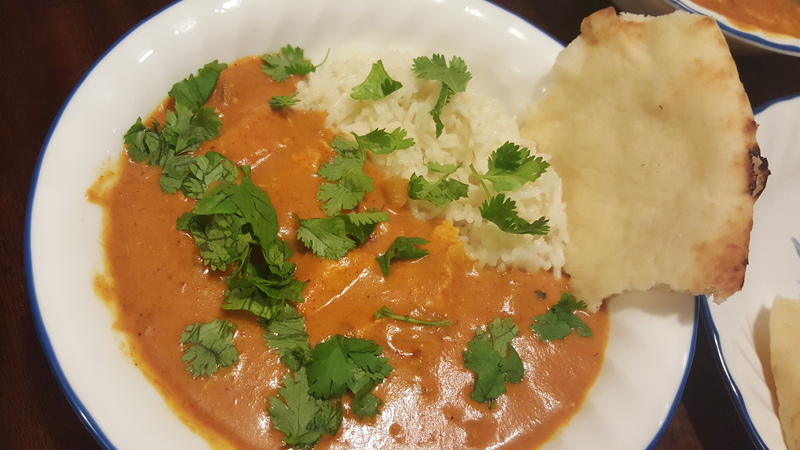 While I do love to make my own curry paste, with school back in session and time at a premium, that just didn’t happen this time. If you do have the time, I definitely recommend homemade as it just can’t be matched in flavor. You can also control your heat level a little easier that way. At the end of the day, grocery store red curry paste is still delicious and much, much faster. So that is what I used. I love to serve Thai curry with rice stick, which is just a thin rice noodle. It does a fabulous job soaking up all the lovely sauce and carrying the vegetables. It is also much quicker and easier than cooking perfect rice. Finally, I topped the dish with half a sliced avocado. 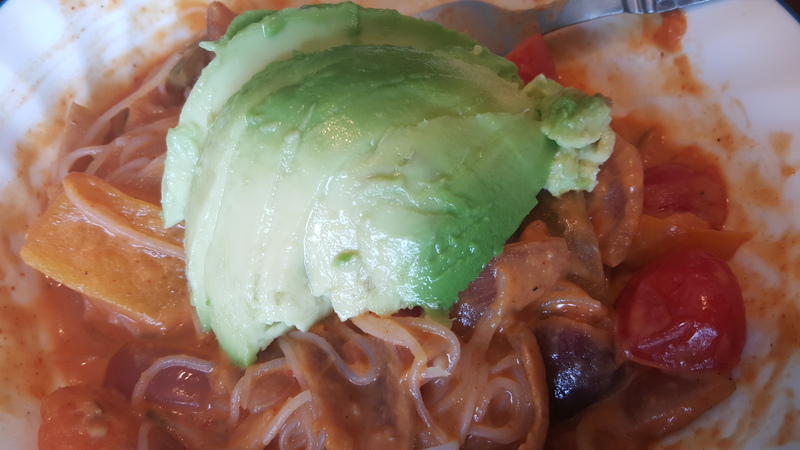 I adore avocado and it is cool and creamy which goes beautifully with the spicy sauce. It may not be the most traditional garnish, but it was a tasty one. On top of all the other delicious reasons to make this dish, it is actually vegan friendly and absolutely healthy! It is literally a giant bowl of veggies. What more could you want? Even my picky, meat-loving fiance scarfed it down. Wedding diet? Heck yeah if it tastes like this! Heat the olive oil in a large skillet over medium heat. When the oil is hot add the diced sweet potato, salt, and pepper. Cook for about 10 minutes, stirring occasionally. 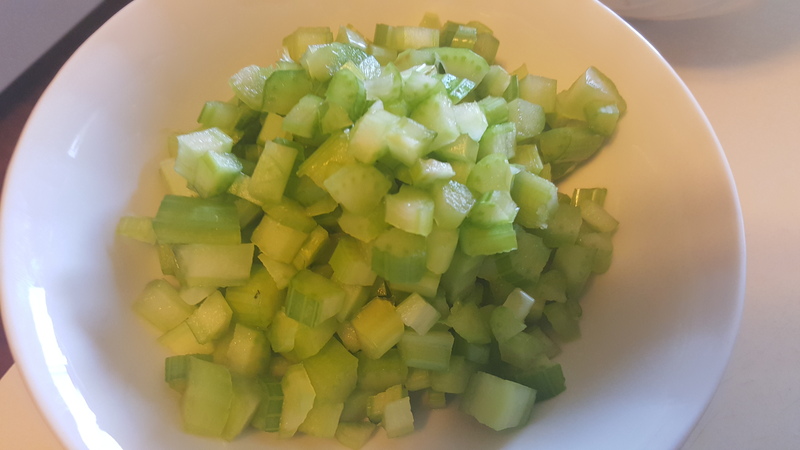 Add the onion and bell pepper and cook for about another 10 minutes, or until they are soft and the onions are starting to turn translucent. Add the garlic and serrano pepper. Give it a good stir and and cook for about a minute. Add the eggplant. Cook for about five minutes, until the eggplant starts to cook down a bit, and add the curry paste. Stir in thoroughly. Continue cooking, and stirring, for about 10 more minutes or until the eggplant is completely cooked down and soft. While the eggplant cooks, bring water to a boil in a sauce pan. Add the rice stick. Cook for about 7 minutes, or until soft, then drain. 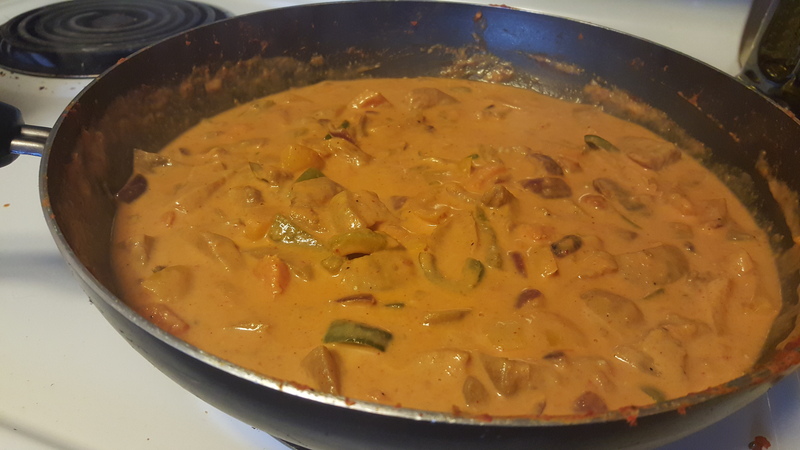 Once the curry vegetables are fully done, add the coconut milk and cherry tomatoes. Stir in throughly and let heat through. You don’t need the coconut milk to simmer as it can curdle if left unattended. The sauce should be rich and velvety, with all the veggies soft. 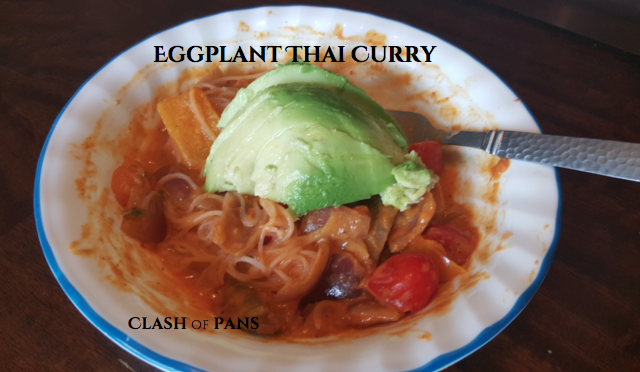 To serve, but desired amount of rice noodles in a bowl and top with the curry. If desired, you can also top with sliced avocado for more color and cool creaminess. Just take a look at that picture. What do you see? Ice cream. You see ice cream. Don’t pretend otherwise. What if I told you that this ice cream was actually HEALTHY?!?! Seriously. 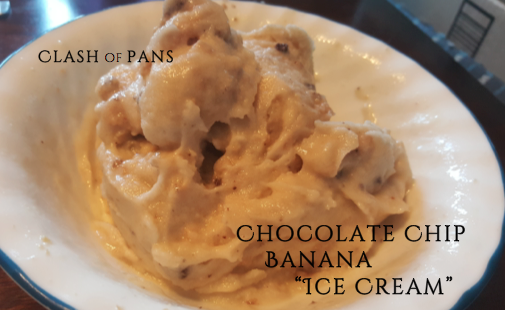 I first saw the idea to make ice cream out of bananas on a cooking show and haven’t been able to stop thinking about it. 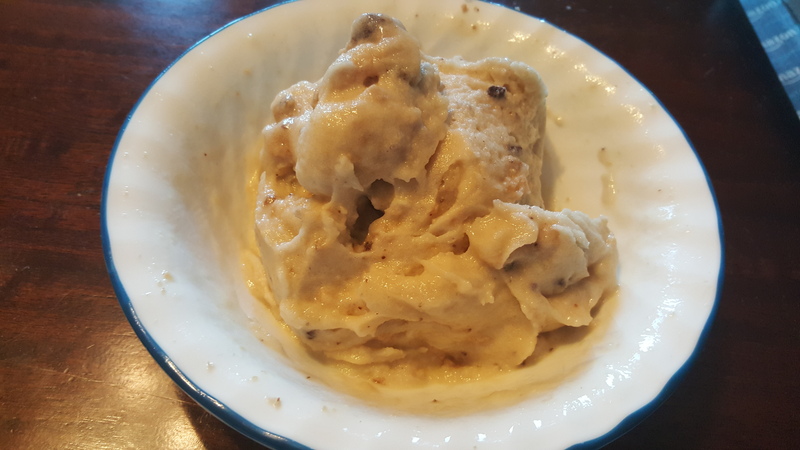 However, I rarely have bananas at home and it seemed silly to buy bananas just to freeze and pulverize them. Little did I know, my fiance bought bananas and put them away where neither of us found them until they were starting to go bad. And voila! Now I have bananas to freeze. 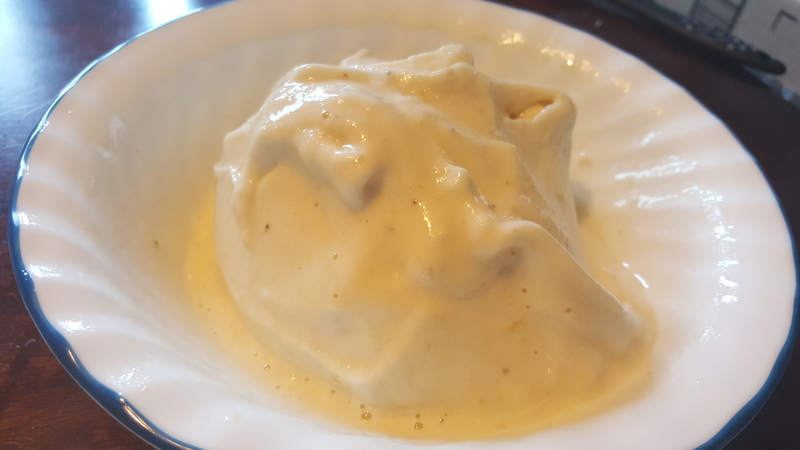 I instantly thought of banana ice cream. 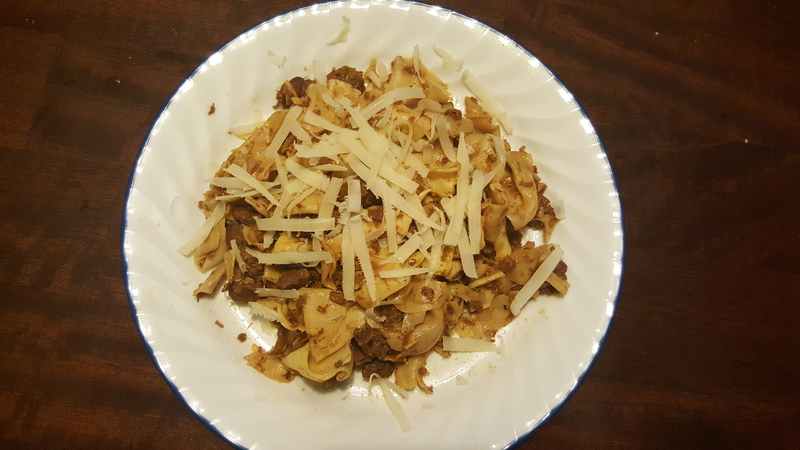 This may take the award for simplest recipe on the blog. And it is ice cream. Winning!!! Take two bananas and freeze overnight (at least). Peel the bananas after they are frozen. You may need to use a paring knife to get you started. After the first strip, the rest should come off easily by hand. Try to get rid of all the strings. Put into a food processor or a Ninja blender. I am not sure a regular blender would work for this. Turn the food processor/Ninja to low and while it is blending add the milk through the top. I had to stop the blender twice to scrape the sides. After a minute or so you should see the mixture turn white and smooth. If you have large bananas you may need to add a little more milk. You want a soft, smooth mix. 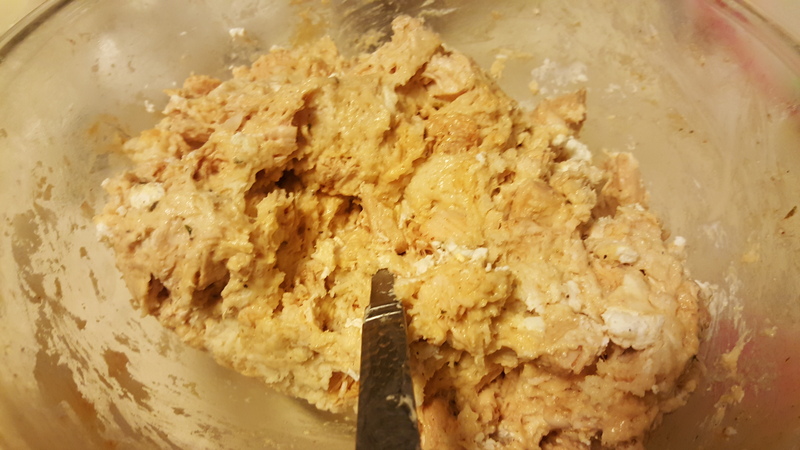 After the mixture is emulsified, remove from the blender into a bowl. Now if you plan to add toppings, fold them into the mix. Pop back into the freezer for about 10 minutes, or until it is a little more solid. Then serve. If you are not adding toppings it can be served immediately, or after 10 minutes in the freezer. Totally up to you. This can be left in the freezer for a couple days in a covered dish. 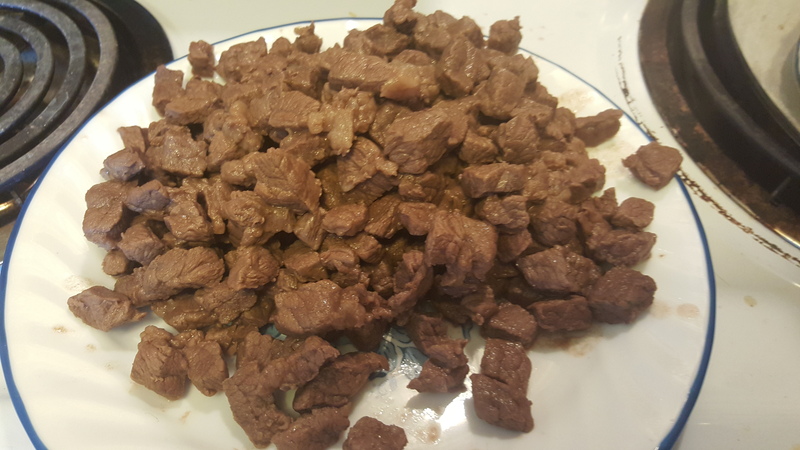 Just let sit out for 5 minutes, then stir before serving. Now go get the ice cream fix in before the warm weather is gone forever! Pin this recipe from our Pinterest Board!